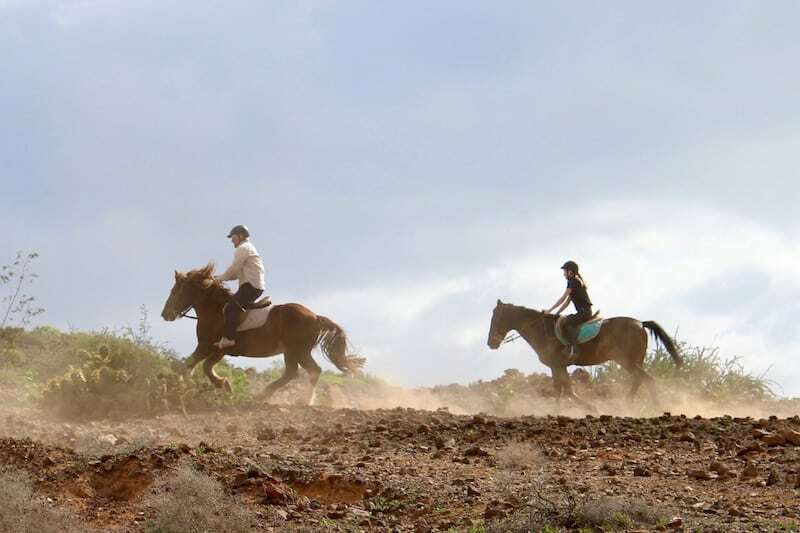 Enjoy a horse riding excursion in Gran Canaria and get to know some of the wildest and most beautiful areas of the island. 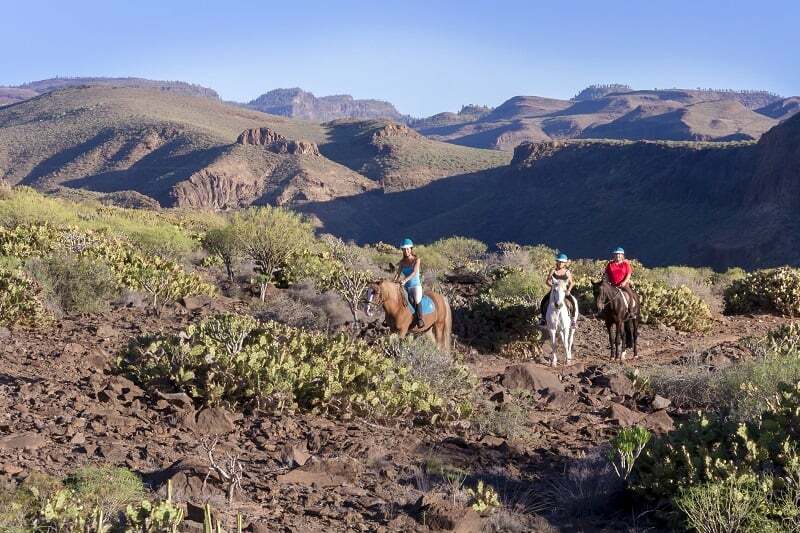 Given the excellent climate of Gran Canaria, you will be able to enjoy riding a horse at any time of the year, enjoying nature and traveling along trails that lead into the mountains. Your horse riding experience doesn’t matter, since we choose the horse and the route suitable for you. We have different breeds of horses and will select one that suits your height, weight and experience. For your peace of mind, the routes are done accompanied by an experienced guide. For groups that have 4 to 14 riders, you will be accompanied by 2 guides. 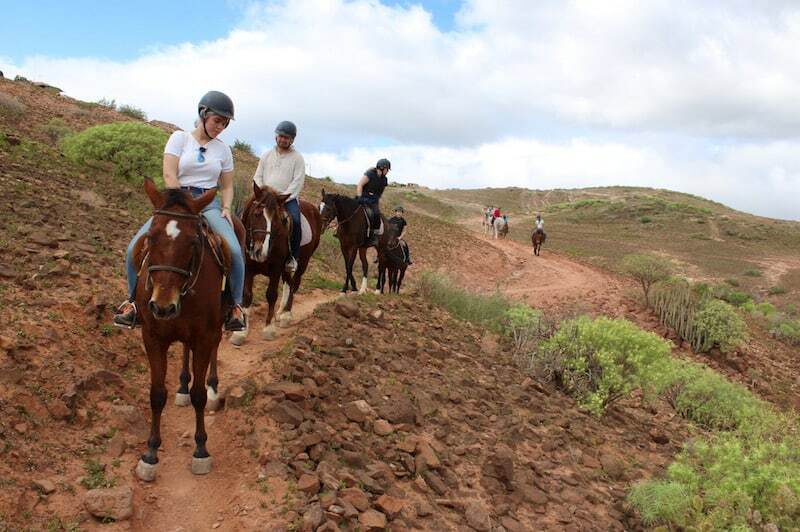 At some sections of the trail, the group will be divided according to experience level so that riders with more experience can trot or gallop, while those who are novices can continue to ride in a more calm manner. Do not worry if you have no experience. 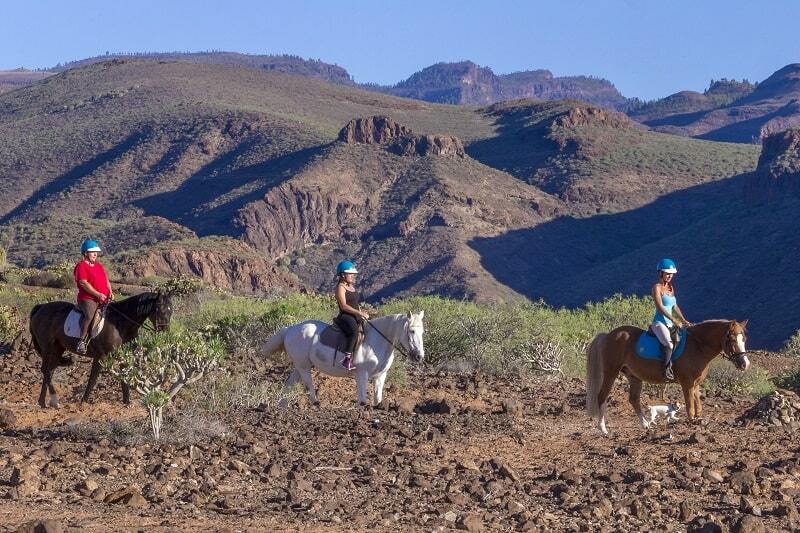 The horses are well behaved and the guides will give you prior instruction in handling the horse so that you can peacefully enjoy the route through the mountains. 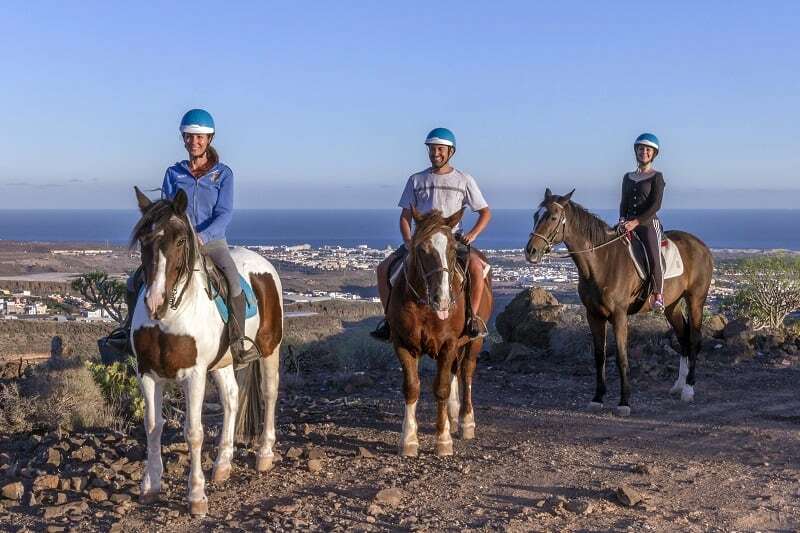 Carpachio, Blanca, Ordinario and Luna are some of the more than 20 horses that we will choose for you and from whom you will be able to contemplate marvellous views at Playa del Inglés, Maspalomas and the lovely Barranco de la Negra. Throughout the year we leave 3 times a day, at 10:00, 13:00 and 16:00. And in the summer months, with longer days, we include an additional departure at 18:30. When making your reservation, indicate which time you prefer in order for us to schedule accordingly. Enjoy an excursion in the morning, afternoon or evening with a beautiful sunset. 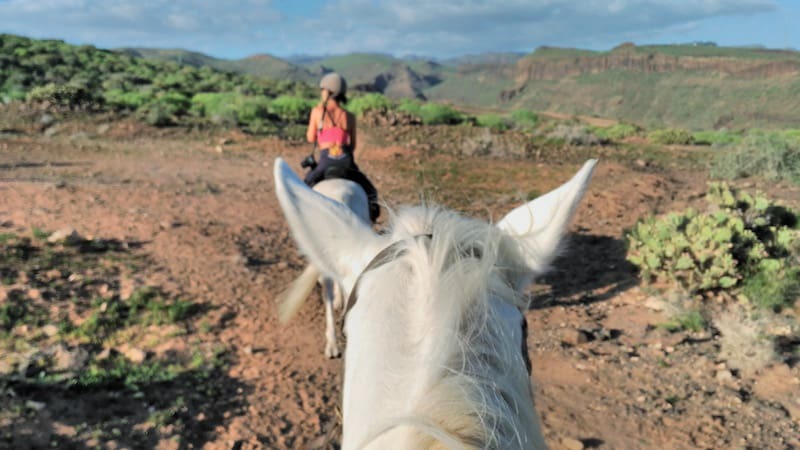 In short, we will do our best so that once the horse ride is finished and you are back at your hotel, you will have the feeling of having enjoyed one of the best moments of your holiday in Gran Canaria. You can also go with a companion and wait in a bar with Wi-Fi while the excursion takes place. I have been riding horses for more than 30 years, and my wife for more than 15, and the tour we did for two hours was special both for its personal treatment and for the horses and the route that we took. Highly recommended if you ride horses. They care that they give these horses and the cleanliness of them is noted. A thousand thanks guys once again. We absolutely recommend it. The island is full of wonders. I am from Belfast and I signed up for the horseback riding tour because it’s my hobby and passion. It was a real treat to enjoy the scenery for a few hours, as well as the ravine at the end of the tour. It has really been worth it. I went with my wife and we are both experienced riders. They took us on a route specially for us. Good horses, good tour and very good treatment by the guides. Absolutely recommended if you go to Gran Canaria. Wonderful. My wife, her mother and I wanted to go with our 2 children, and they explained to us that it was best if we split into two groups. The older ones went in a group and we did the two hour tour and my children did the 1 hour tour. Highly recommended. We went as a group of 4 and we cannot say enough about the treatment at all times. Half of us have experience, and it was the first time for the other half, and at the end they wanted to go back and do it again. Another positive was that they brought us from the hotel to the horseback riding area, which is much easier. Group of 3. We paid for 2 hours. The tour guide asked us how we were doing at all times since we were novices, and if anything happened to us, there he was. The only downside is that we did not go to the beaches at the end because they are not doing that tour nowadays. Anyway, it was great to start. Now we know for next time. Everything was fantastic. We enjoyed both the mountain scenery and the riding, and the time passed quickly. My girlfriend and I are very adventurous and we decided to try this riding tour. We’re very happy with the experience and the guides were always attentive. If you’re like us and not very experienced, at the end of the journey you might be a bit sore but it is worth it. The staff were very nice. I have been riding since I was a child in my home country Germany, and now that I am living in Erasmus I have not missed an opportunity to go on a horseback riding trip through the mountains. Anyway, if you have no experience yourself, they will adjust to you and teach you the basics to start riding. You certainly will not be disappointed. I loved it, very friendly. Go with your partner or some friends and learn to ride, go on a walk and have some personal time with the horses. It’s worth a try. Great to do something different! 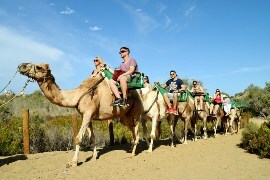 Even thought we had no experience, we went horse riding Gran Canaria in a tour and we had the best time in the island. Worth it. Three of us went, two having barely any experience and a friend who has been riding for years. They gave us a horse according to our experience and took us on a custom ride. The treatment was very personal. Perfect. I always go horse riding in every country I visit, and this time has been one of the best trips. Really special. I have been riding for more than 10 years and I booked this tour based on the recommendations of some friends of mine. The horses, the tour and the professionalism of the guide are what make my friend and I recommend this tour. 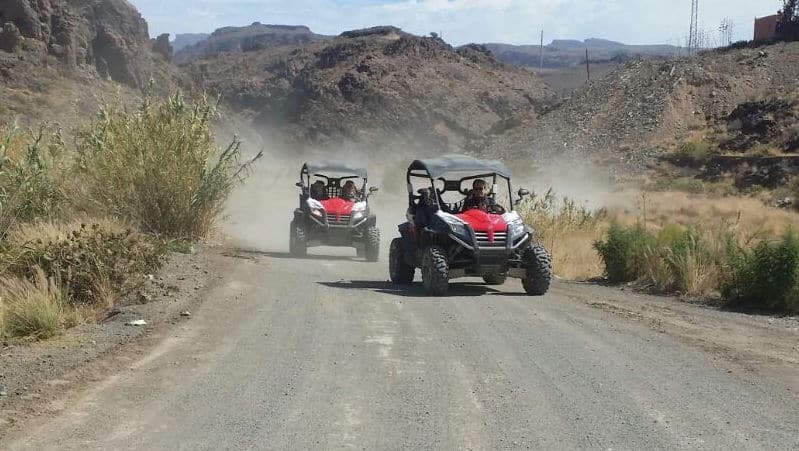 Our guide has been very close and given spectacular treatment to my daughter and I. It’s the best riding tour that you can find in the southern part of the island. Everything is brilliant. 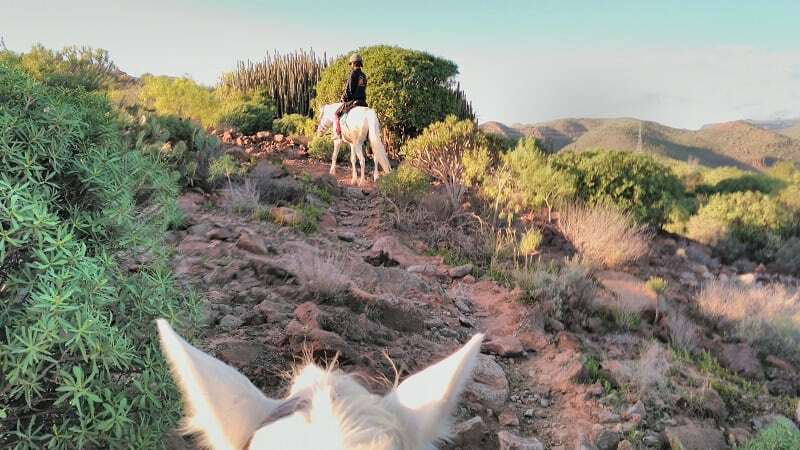 I went with a friend who has horses and who convinced me to go on a 2-hour riding tour during our trip to Gran Canaria. The service, the horses, the tour and the treatment of the guides was fabulous. Highly recommended. Highly recommended. I have been riding for many years, and my daughter and I booked a 3 hour tour in order to be able to ride on the beach. Incredible. Beautiful tour. 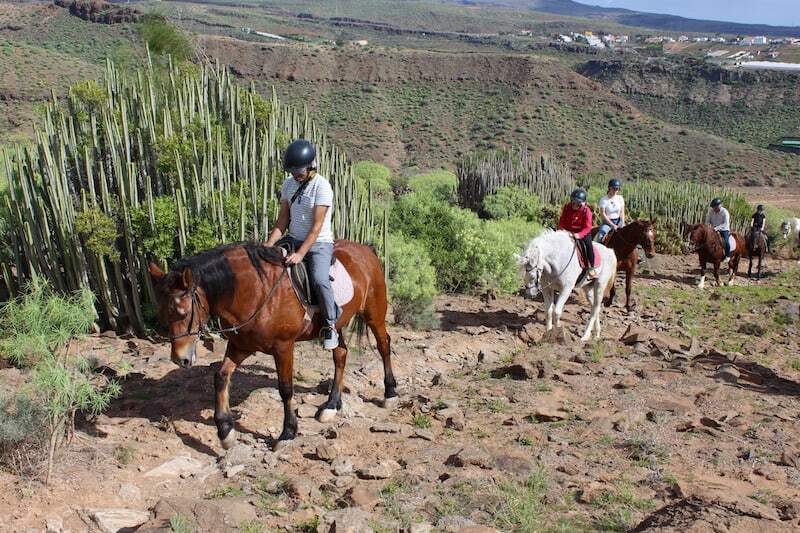 We took the 3 hour excursion and had a marvellous time horse riding Gran Canaria galloping in a nice ravine. When the horse that touches you is named Hercules, it’s priceless, hahaha. I was already confident but the guides motivated me a lot on the route. It was an unforgettable experience. I will return soon to do it again with my husband. Thanks. The warmth with which the team treated us made my partner and I, who have only ridden a couple of times before, feel comfortable, and we enjoyed two pleasant hours. 4 of us friends went on a horse tour just for us. Two of my friends had experience, but my wife and I were first-time riders. They gave us horses based on our experience and took us on a fantastic 2 hour ride. Worth it. 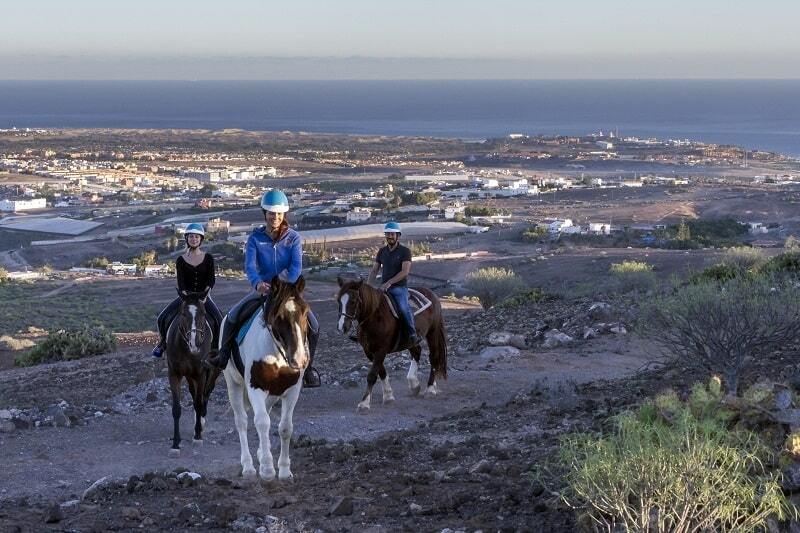 I am an experience rider and horse riding Gran Canaria with OK Gran Canaria was a great expererience. Fantastic tour and Service. Thank you! How old do you have to be to ride? Can children younger than 6 years go? Do they have to pay? Children younger than 6 years ride on the same horse as their parent and do not pay. Yes, we can pick up companions for 10 euros per person. Companions can wait at the bar. We have Wi-Fi for your entertainment. Is the horse ride done if it’s raining? What if it is very hot? Normally, if it is not too hot or too rainy, we will go out. However, you have the option to change the date or departure time if you wish. You should wear close-toed shoes, long pants and clothing according to the time of year. It is best to always wear some warm clothing if at any point the route is chilly. How many times do you go out each day? What is the size of the groups? The maximum size of the groups is 14 people, but groups of at least 4 people always leave with two guides. Can I purchase a private excursion? During most of the year, except Holy Week, summer and Christmas, we do private excursions. 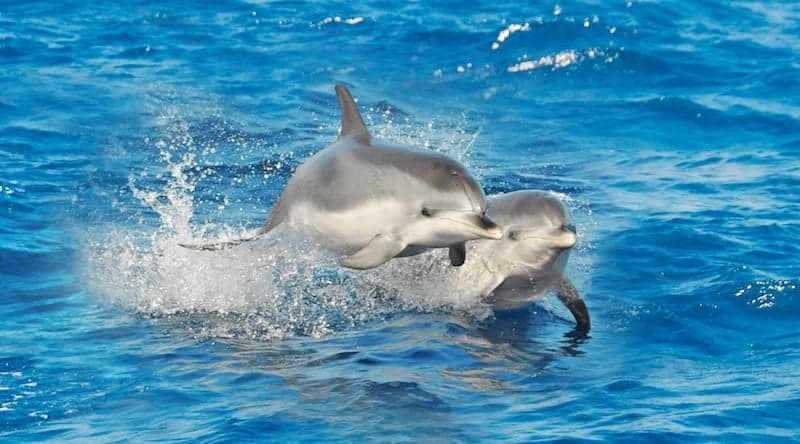 The price for this excursion is 80 euros per person. Which hotels do you pick up at? When making the reservation, indicate the name of your hotel and whether you would like hotel pick up. The pick-up can be done at any place in the southern area of Gran Canaria: Bahía Felíz, San Agustín, Maspalomas, Playa del Inglés, Meloneras, Arguineguín, Puerto Rico, Amadores, Playa del Cura, Taurito and Puerto de Mogán. Pick up is free except for hotels in the Municipality of Mogán, which have a supplement of 10 euros per person. How will I know the time and place of the pick up? We will be in touch with you via email in order to give you this information. How much do I have to pay when making the booking? When making the reservation you don’t pay anything. Everything is paid before the excursion begins. What do I have to do in order to make a booking? Send us an email with your name, the number of people who will come with you, the name of your hotel and room if you know it, and the level of horse riding experience of each person who wants to come. In addition, if you are very tall or weigh more than 90 kilos, it is convenient that you tell us so that we can choose your horse in advance. 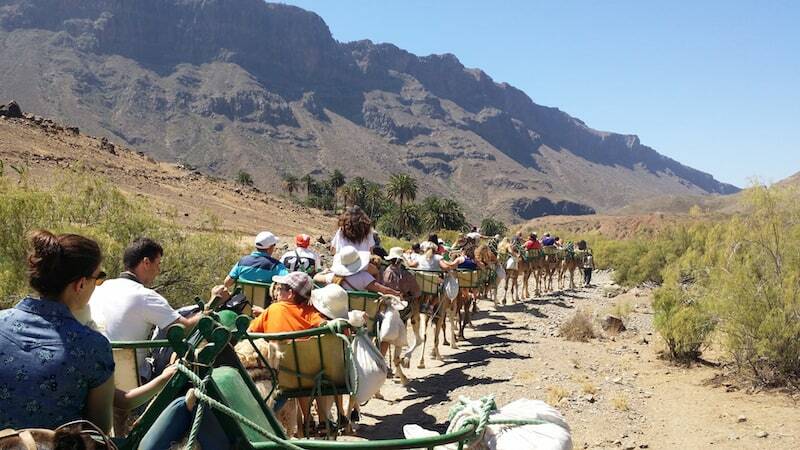 10:00 h. and 16:00 h.
Enjoy an unforgettable day and the unique experience of a camel ride through the enchanting Fataga ravine in Gran Canaria. Be a Tuareg in the Sahara for a moment, take a ride on the back of your dromedary (camel) and get the desert-feel!